This quote comes from the concluding paragraph of John Muir's article on “The American Forest” which he contributed to the August 1897 issue if The Atlantic Monthly. He wrote at length about the forest management efforts of other countries around the world, and contrasted the way in which American forests were being taken advantage of in ways that caused deterioration. He worried that clearing could leave nothing but barren wastes. Muir’s article, which can be real in full here, also included a survey of the unremediated damage done by railroad companies, shingle makers, sheep farmers clearing land, harm from soil erosion of bared mountain sides, and outright theft of hte public resources. He appeals for federal oversight to be more effective. “All sorts of local laws and regulations have been tried and found wanting, and the costly lessons of our own experience, as well as that of every civilized nation, show conclusively that the fate of the remnant of our forests is in the hands of the federal government, and that if the remnant is to be saved at all, it must be saved quickly. 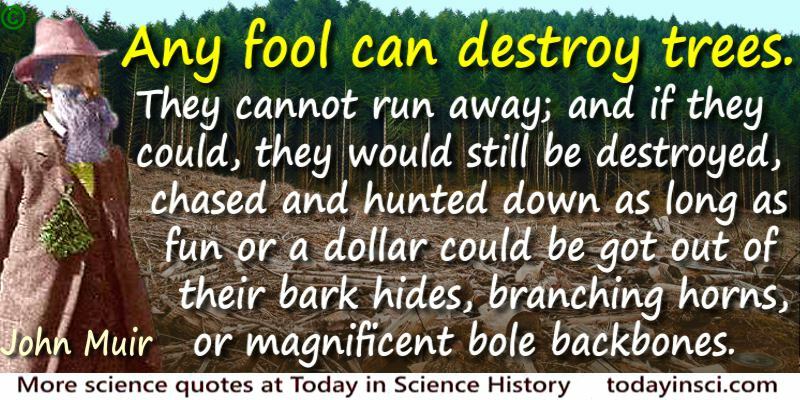 Any fool can destroy trees. They cannot run away; and if they could, they would still be destroyed, — chased and hunted down as long as fun or a dollar could be got out of their bark hides, branching horns, or magnificent bole backbones. Few that fell trees plant them; nor would planting avail much towards getting back anything like the noble primeval forests. During a man’s life only saplings can be grown, in the place of the old trees — tens of centuries old — that have been destroyed. Science Quotes by John Muir.